After a summer of radiation treatment misery, I felt recovered enough by the middle of September to try and get in a High Sierra backpack fishing trip, but where? Last summer's fishout which went out of the Second Recess of Mono Creek over Gabbot Pass to Lake Italy, acquainted me with the Hilgard Fork of Bear Creek. On that trip I refused the beckoning of several miles of very trouty looking water along the fork as we hurried down to the main branch of Bear Creek, resolving to return anothe day. A repeat of last year's itinerary was not attractive, so how to do it? Some map work showed a possible loop route out of the Pine Creek trailhead on the east side of the Sierra. It would be a first day climb of 2500' to lower Pine Lake. From there it would go over Italy Pass (12,400') to Lake Italy and the Hilgard Fork where I would spend some time. 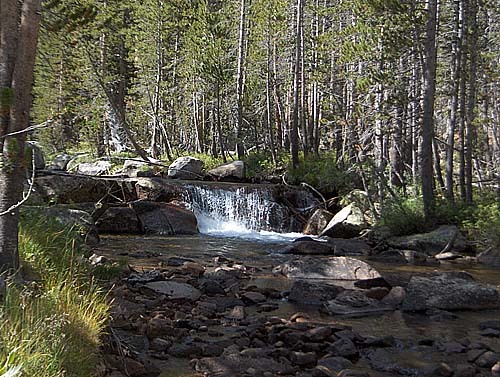 Down at the main branch of Bear Creek, it would be south on the Muir Trail over Selden Pass (10,900') to the junction with Piute Creek at the north end of Kings Canyon. From there it would be up Piute Creek to Hutchinson Meadow. Here we would turn up French Canyon and go out of it over Pine Creek Pass (11,100') and back to the trailhead. With my wife Pat, I headed for the Pine Creek trailhead which is reached on a paved side road from US 395 about ten miles north of Bishop. 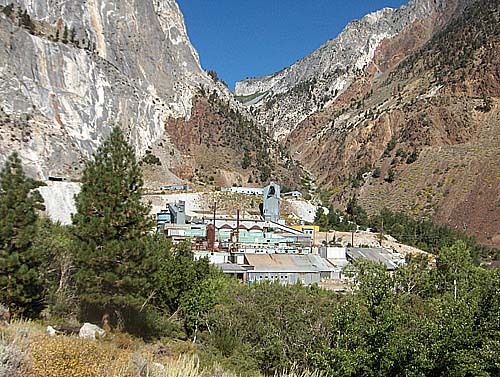 The trailhead and bottom region of Pine Creek is dominated by what is said to be the world's largest tungsten mill--now inactive and said to be slated for removal. The trail follows a road up to one of the mine shafts. With less than optimum fitness and only two days of altitude acclimatization, the climb from 7400' trailhead to Lower Pine Lake at 10,000' was an ordeal. The reward was an evening's fishing for some lively brookies in the lake. The killer fly was a Rollover Scud, described by Gary LaFontaine in his book Fishing the Mountain Lakes. 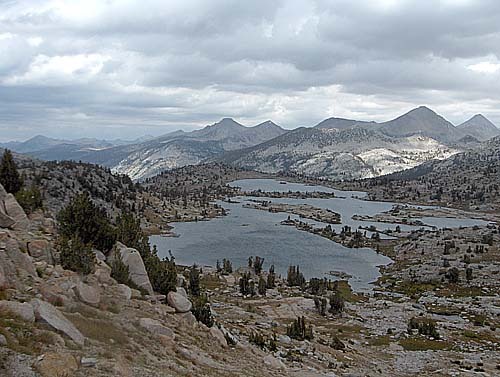 The next day extended the ordeal as we worked out way up past Upper Pine Lake, Honeymoon Lake, and up into the barren upper reaches of Granite Park. We camped at the highest lake below Italy Pass. None of our casts there turned up any fish. My guess is that the lake is sterile. The next morning got us over Italy Pass and down past Jumble Lake to Lake Italy. Here's where things got interesting. The south shore of the lake has some steep granite slabs. Both last winter and the one before were very heavy snow years leaving quasi-permanent snow banks on these slabs. This makes them a high risk proposition to cross. A slip would deposit one pack and all in deep water. Confronted with this, last year we changed our plans and went a different way. This year we had to get past or return the way we came. It would make a great story to say that I rigged up a raft with my frame pack and empty bear cannisters for floatation and swam around. The truth was, we were a month later than last year. 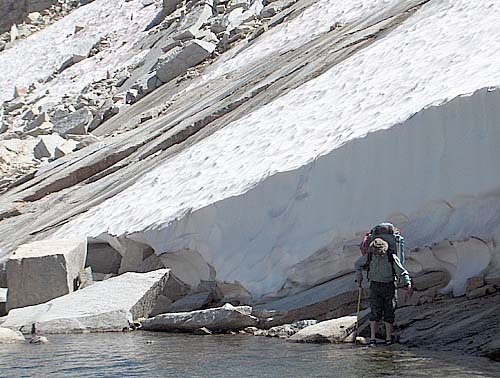 It had melted out enough that it was possible with a little wading to walk by the bottom edges of the snowbanks. Getting past Lake Italy put me into the Hilgard Fork of my dreams. We camped by a nice set of pools and riffles. 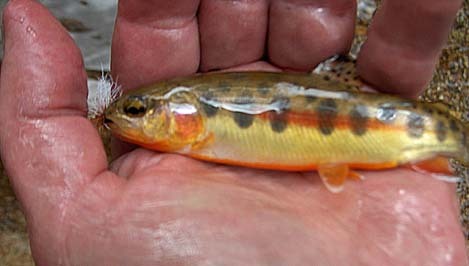 The water was full of very eager golden trout...none of which was more the 5 inches long. So it was also the next morning and we made a leisurely descent of the Hilgard Fork down to the main branch of Bear Creek. We stopped many places to fish and found it the same story all the way down--very small fish. It's funny how some water can look better than it is. The camp down at the main fork did have some good fishing to look forward to. Last year Tony Plutynski clued me into some small lakes near there, just loaded with good-sized hungry brookies. Four of them were "invited" to dinner. Overnight it rained some, and the next day dawned cloudy, cold and blustery. Between us and Selden Pass was Marie Lake which I hoped to fish. 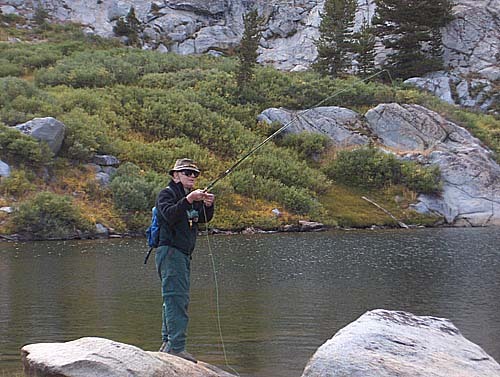 Steve Beck didn't give it high marks in his book Fishing the John Muir Trail but I wanted to try. The wind was howling when we got there, and the only possible fly cast that one wouldn't end up wearing was a downwind roll cast, possible from only a few locations. So Marie lake remains for another trip. From here, it wasn't far to get over the second of the high passes Selden Pass, 11,900'. South of the Pass are the Sallie Keyes Lakes. Here our luck changed. The clouds moved on, the sun came out, the wind died down and the fish began to bite. Again I did well with a Rollover Scud catching goldens of respectable size. 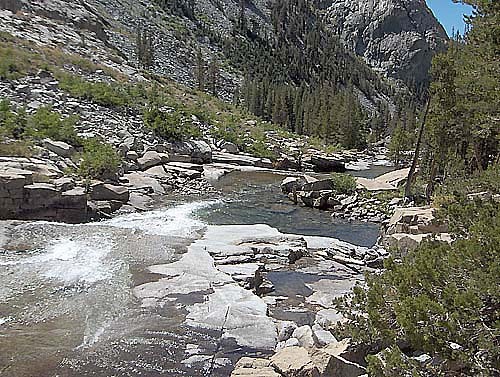 The following day we made our way down to the junction of Piute Creek and the South Fork of the San Joaquin at the northern entrance to Kings Canyon National Park. The map indicated a lot of nice flat ground to camp on and easy access to the river here. Instead we found a hell of dense Manzanita, boulders and timber blowdown, and had to cross into the park to find a camp. This crimped our fishing time a lot and I only got a couple here. Piute Creek was steep to start with the next day, but eased off as we got higher. At one spot we stopped, Pat spotted a small fish trapped in a pool no longer connected with the stream. Rescue was proposed. He refused a number of presentations, so I dropped my fly into the main stream and immediately hooked up with a nice sized golden. After releasing it, I dropped the slimed up fly back into the pool with small fish, and he took it. Hope he likes life in the main stream. We stopped and camped at Hutchinson meadow. This is where the trail over Piute Pass comes in. Fishing for goldens was good here. The next morning, having three days food left, but only two days walking to get out, we decided on a side trip to a high lake from the main trail up French Canyon over Pine Creek Pass. Elba Lake was our choice. Fishing was fair with the Rollover Scud as the best producing fly. Our next to last day got us easily over 11,100' Pine Creek Pass and down to Lower Pine Lake. Pat had it in mind to try smoking some fish that we caught. She had brough along enough salt to brine them before smoking then and devised a smoker using an existing campfire ring, some green willow twigs and her poncho. It worked quite well, but that poncho is going to have an aroma for the rest of its life. Speaking of smoke, the smoke from the big Los Padres fire found its way to us by evening, dimming the sun and filling the sky. By the next morning, it was really thick and we could hardly see the mountains around us. We fairly hastily packed up and got down the mountain to the trailhead, but by the time we were there, it had mostly dissipated. We would have stayed awhile fishing if we had known. 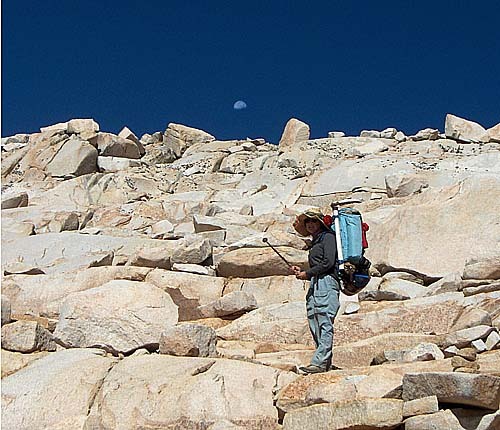 On a backpack trip, a rod carried rigged and ready to cast as one hikes the trails, will sooner or later be broken when the tip is jammed into the ground in a moment of inattention. But if the rod is carried securely in its case, when attractive water beckons, one must stop, join up the rod sections, attach reel, rig line, and tie on fly to fish, and reverse all this when done. Much attractive water will be refused with this price to pay. There is a third way. On this trip, I carried a telescoping fly rod. In the collapsed condition it's only 16" long. Rigged with a reel and line threaded through the guides and fly on the end of the line, it extends to its 8' length and is ready to fish in seconds. It collapses with similar efficiency when you are done fishing while staying rigged and ready with the fly still on the line. I fished a lot more places than I would ever have otherwise. 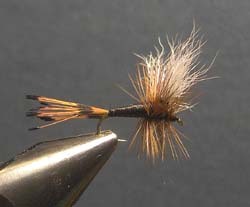 The Rollover Scud is a Gary LaFontaine pattern described in his book Fly Fishing the Mountain Lakes. It's tied with weight along the top of the hook shank so that at rest in the water, the point of the hook is up. On being moved by pulling the line it turns over to point down. Gary reckoned that this rollover was irresistable to fish. I am inclined to agree. At this link is the how-to-tie for my version of it. 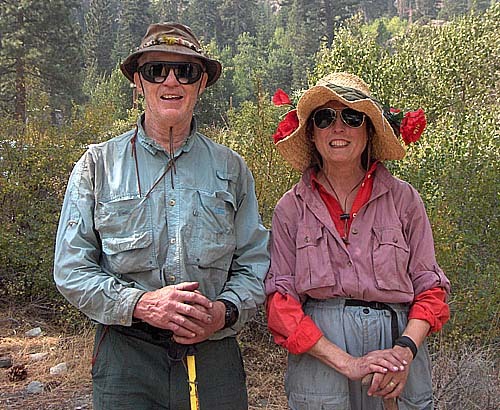 My go-to fly for dry fly fishing High Sierra Streams is a classic old pattern called the Captain. I learned about it from Bill van Loek's book High Sierra Fly Fishing. The wing is calftail, the hackle is brown, the tail is golden pheasant tippet, and the body is black polypro yarn.